Years ago, we had a great little independently owned pizzeria in town that had the best Chicken Florentine Pizza! Joey’s Mom made all of his sauces from the “old country”. All of his ingredients were very fresh and his food was awesome! So, I’m sure you have seen my Garlic Scape and Herb Compound Butter. (Look at that post if you don’t know what garlic scapes are!) It is the bomb! We’ve used it on fish and chicken, … coming soon to BCC, veges, which are on the butter post. Hold the presses though, the pesto may actually be better! It is, basically, a traditional pesto but has almonds, a bit of basil and parsley and a ton of Garlic Scapes! This Garlic Scape Pesto is a must try! So…. Eric and I have been thinking about doing a pizza with Joey’s Chicken Florentine Pizza (the aforementioned Pizza Shop, stay with me people) but I couldn’t get my head around a good for base for it. His had a nondescript sauce that was, as I said, stupidly garlicky! The difficulty is finding the garlic scapes. You have less than a month and also, the farmers do not realize they are saleable. Which, my friends, is a pity! I have tried to educate my local farmers, but I finally resorted to growing some garlic myself! I was afraid that my soil was too clayey, but I have grown it for 3 years now, and it’s fun, as well! If you can’t find garlic scapes, I think a good substitute would be roasted garlic, at other times of the year. Ah, yes. We are talking about Pizza! We have only grilled pizza a few times and suffice it to say, they were not photo worthy! This one was too good not to be photo worthy! The rest is a piece of cake. Make sure your chicken is cut into small bites and saute the spinach after the chicken is removed from the pan! The thing with grilling the pizza is that you have to grill one side for 3 minutes, or so and then flip the crust over. Then you can add your toppings. It’s well worth learning the technique to grilling pizza because the pizza has a nice smoky flavor from the grill. This pizza is soooo good! Looking at it makes me want to make it for dinner tonight! 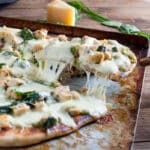 I hope you enjoyed today’s recipe for Chicken Florentine Pizza! What is your favorite pizza? Leave me a comment down below! This Chicken Florentine Pizza is to die for!! You will NOT be disappointed! Place all ingredients in food processor bowl, except the olive oil. Process until very fine. Drizzle in olive oil, with blade moving, until a smooth paste forms. You can add more oil, if you would like the pesto thinner. Cut chicken into small cubes. Brown in olive oil over medium high heat on all sides until lightly browned. Remove chicken to a plate. Set aside. Saute' spinach in the same pan just until limp. If grilling, heat the grill to very hot. 500°F. Place dough on rack, pizza stone or grilling pad. Close lid and cook for 3-4 minutes until firm and browned, but not burned. Be careful and check often because it will burn easily. Flip dough. Top Pizza with 1/4 to 1/2 cup of the pesto. Then add chicken, spinach and finally the mozzarella. Grill for another 3 or 4 minutes until the bottom of the crust is lightly browned. If cooking in oven, heat the oven to the highest setting it will go, 450³ or 500°F. Place constructed Pizza on pizza stone or cookie sheet. Bake about 15 minutes until crust is golden brown and cheese is melted. « Eric’s Lemon Chicken Thighs- Easy, Delicious Weeknight Meal! I have a new love for garlic scapes! They are my new favorite food. This was the first year I’ve tried them! Thanks, Dahn! I LOVE grilling pizza and this sounds so yummy!! But what exactly are garlic scapes?? Oh, sorry, I should link to my post explaining garlic scapes. Garlic scapes are the flower stalk and the bud of the garlic plant. If you don’t remove them before they bloom, they remove nutrients from the bulb. You will get a very small bulb when you harvest! My kids and husband love pizza! The garlic flavor sounds delicious! The garlic really ramps up the flavor!! It really is a beautiful thing! OH! I am needing this pizza right now! How delicious! Oh my, I just got instant cravings for this pizza! Also, I love that you grilled this! Thank you Lindsey! It really was beautiful grilled! Nice, crispy crust! Homemade pizza is the best! Love that nice layer of basil! It’s actually garlic scape pesto! Even better than basil! Thanks, Ginny! Yum! I love white pizzas. I think the addition of chicken and the delicious garlic scapes would be fantastic. Great idea! Thank you so much, Michelle! It really was a great combination!